Last Saturday my church held a Women’s Retreat – a time for the women in the community to gather and talk and share parts of our life stories with one another. It was a really fun and energizing day and I am so glad I got to be a part of it. Like last year, I made three salads again. I hate to be trite, making salads for women, but everyone really likes them and it’s nice to have a light, refreshing meal. They’re also easy to keep vegetarian, and easy to make a lot of. Plus I think it’s fun to introduce people to new, creative ways to eat salad. Let’s be real, everyone can use more vegetables in their diet, so having fun, inspiring salads is my way of encouraging that. I love to introduce people to new foods, so I always get excited when someone tells me they haven’t tried a food. I think I convinced several kale-newbies how awesome kale can be. 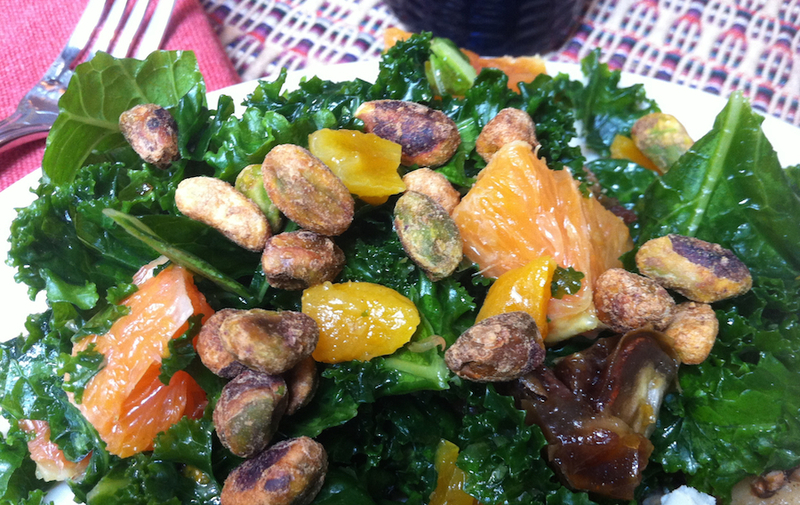 Specifically how awesome raw kale can be (all it needs is a good massage…don’t we all!). This was definitely the most popular salad of the day. And it really is a stunner. The bright citrus pairs so nicely with the hearty kale. The dried fruit adds a bit of sweetness, so there’s always a new taste and texture with every bite. This is also a great dish to increase your iron intake. Iron is an important nutrient that helps us feel energized (by carrying oxygen to our cells), and many women don’t get enough. But by adding vitamin C-rich citrus, with the iron-rich dark leafy greens, you actually increase the absorption of iron into the body. Healthy and delicious, it’s a win-win! In a jar or measuring cup, whisk together orange juice, oil, vinegar, cumin, salt and pepper. Taste, and adjust seasoning as necessary. 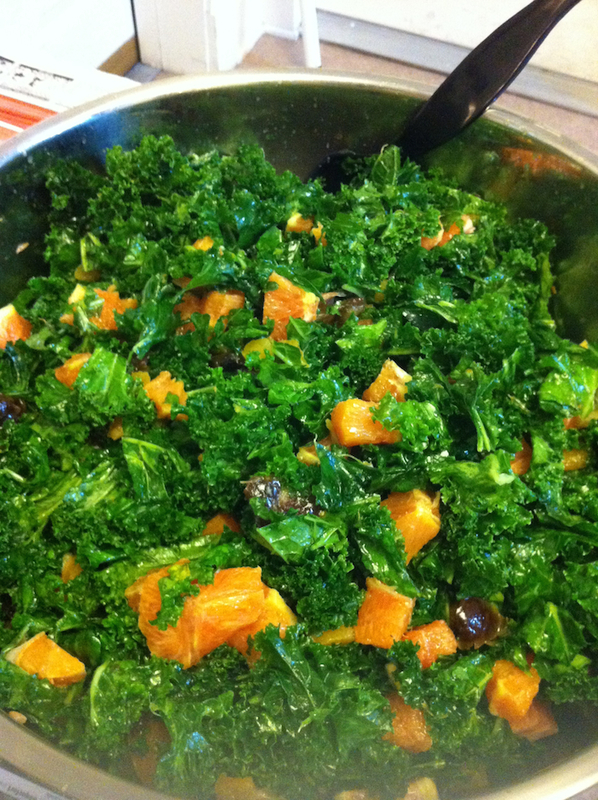 In a large bowl, toss kale with about 1/2 the dressing. Using clean hands, massage (rub the kale between your palms, or grab it in fistfuls to crush it) the kale until it is dark green and glossy. Toss the salad with the remaining ingredients, adding more dressing as desired. Salad will keep refrigerated for a couple of days, although I’d recommend adding the pistachios right before eating. Sounds delicious, Lauren! What other two salads do you offer? I also made a Lemony Orzo Feta and Chickpea Salad and a Wheat Berry Waldorf Salad. Recipes coming soon!